The BlackBerry Storm 2 has arrived to try and save the BlackBerry touch screen reputation after a pretty disastrous Storm 1 entrance last year. I used a Storm 1 and can safely say that while I'm a huge fan of Research In Motion 's (RIM) BlackBerry products (I've been a user since 2000), I was excited to see how RIM would jump into the touch screen Smartphone ring, and then immediately disappointed at the product I was holding in my hands. It was laggy, buggy, kludgy, and the whole having to click the screen paradigm combined to make me feel like hurling it at the wall many times. The BlackBerry Storm 2 is much better in many ways. It doesn't lag, it has fewer bugs, and typing doesn't feel as kludgly as before. You still have to click the screen, but even that has improved drastically. 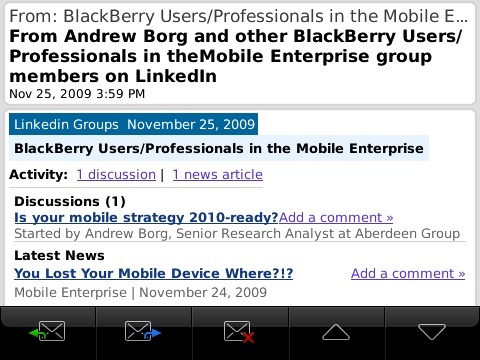 So the question is, can this new improved touch screen BlackBerry survive in the corporate world? 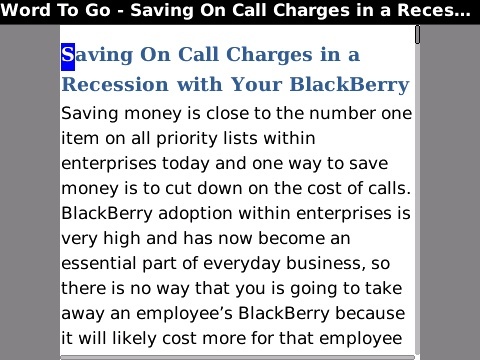 Can it handle the day-to-day work use and even enhance your existing BlackBerry experience? Finally, does it look professional enough to carry into the boardroom or courtroom? While the Storm 2 has many consumer features, I won't go into those in great detail because there are other reviews that do this. I'll be concentrating on the enterprise usage, which of course does include some consumer use. The Storm 2 looks very classy. I think it goes very well with a suit and tie, but can also hang out with you on the weekends. The single piece glass screen that includes the Call, Menu, Escape, and End buttons looks up market and conveys a professional feel. The gap between the screen and the rest of the BlackBerry is tiny and adds to the high-end finish of the Storm 2. Even the back of the Storm 2 looks good with its real brushed aluminum battery cover and clasp-less mechanism. A Smartphone worth its salt needs to hold a charge allowing the business person to go about their normal day of conference calls, emails, attachment viewing and editing, and a little music on the side. Going just by RIM's numbers, the Storm 2 has slightly less talk time and standby time than the Storm 1. It's really only 30 to 60 minutes less depending on the network (CDMA or GSM) you are on. While it is down slightly, the Storm 2 should get you through at least 1 day with medium use. Browsing through the CrackBerry forums seems to back that up with most people getting at least 1 full day of usage, sometimes 2. 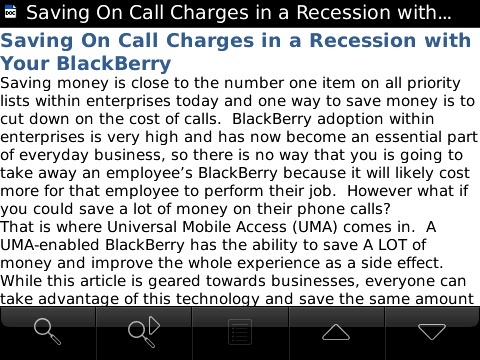 If you are a seasoned BlackBerry user then you will actually see a benefit to browsing on the Storm 2. 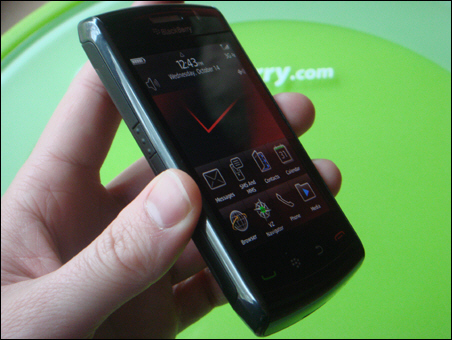 The screen is 25% larger than other BlackBerry's like the Bold 9700 or Tour, and while the screen resolution is the same, the physical area is larger. This extra area provides a more comfortable browsing experience. The Storm 2 does have flick scrolling so you can actually flick the screen up and down to quickly get around a web page. No gestures like pinching and expanding your fingers to zoom in and out, but clicking the zoom button does provide a snappy zoom. Compared to other latest-generation Smartphones, the browsing on a BlackBerry Storm 2 (and indeed all BlackBerrys) is poor, but if you already have a BlackBerry, you'll feel right at home and see the benefit of touch and a 25% larger screen. RIM announced that a WebKit browser is coming soon, so things should improve greatly for the BlackBerry web browsing experience soon. Since BlackBerry OS 4.5, we have had document editing, and document viewing has been around for longer than many can remember. The Storm 2 with its 25% larger screen provides you with what you'd expect when viewing a document, more of it on the screen at once. This is exactly what you get. As you can see from the screen shots, the font size looks the same on the Bold 9700 and the Storm 2. This is because the viewer on the Storm 2 is actually decreasing the font size to fit more in on the screen. Since the screen is physically larger, decreasing the font size makes the text appear to have the same physical size as on the Bold 9700, while retaining its clarity, and increasing on-screen word count. Document editing though seems to have an issue. 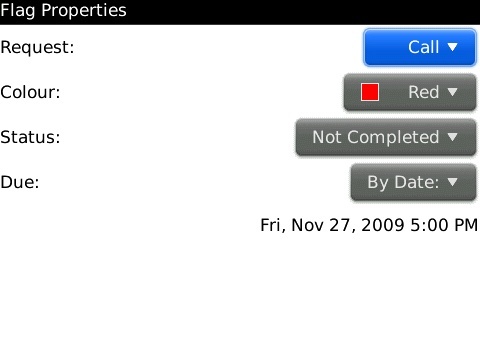 DataViz's DocumentsToGo provides the document editing for the BlackBerry and does a pretty good job of it. 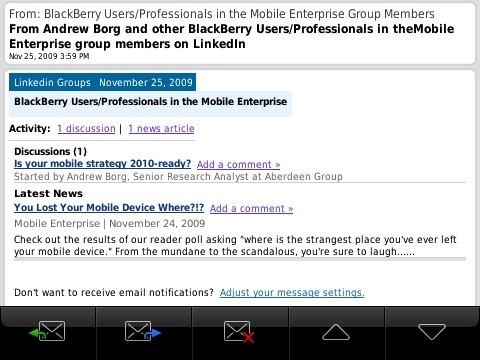 You would think that editing a document on the Storm 2 with its larger screen in landscape mode would provide a benefit over other BlackBerry models. Sadly it does not. It seems that a design flaw or bug in DocumentsToGo renders documents in portrait mode, even when you rotate the Storm 2 to landscape mode. In this screen shot, the Storm 2 is in landscape mode because you can see the document title span the entire screen, however the document is caged into what appears to be the portrait view. The end result is the Storm 2 fitting slightly less text in compared to a Bold 9700. It's not all bad though. The text is larger, making it easier to read, and the snappier CPU on the Storm 2 makes editing a pleasure. 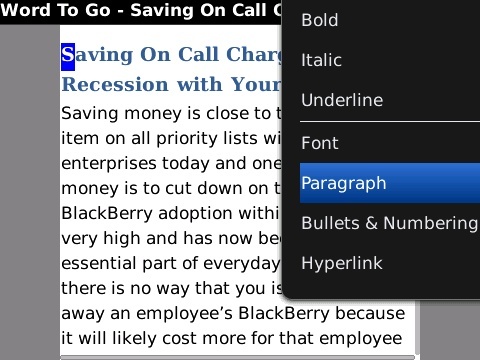 As with other BlackBerrys, you get limited document editing with the included version of DocumentsToGo, and many more when you pay to upgrade to the premium version. While available on other BlackBerrys running OS 5.0 or later, features like the ability to flag a message for follow-up, remote searching your corporate mailbox, and the ability to see meeting attendee's free/busy is a huge help for the professional on the road. The big benefit with the Storm 2 is the larger screen. In landscape or portrait mode, you can decrease the font size without compromising text clarity, allowing you fit more on the screen. I really had a hard time typing on the Storm 1. It felt like the screen was trying to bounce your thumbs away. Typing in general on the Storm 1 was just too difficult. The Storm 2 has addressed this issue. The SurePress screen is now friendlier to our thumbs. The clicking is softer and more refined. You don't feel like the screen wants to repel your thumbs, which allows for a faster and more pleasant typing experience. In fact, I can now type faster on the Storm 2 with fewer errors thanks to the redesign. If you are a BlackBerry user ready to experience the best BlackBerry touch screen Smartphone, the Storm 2 is for you. It really has addressed the SurePress issues that plagued the Storm1. 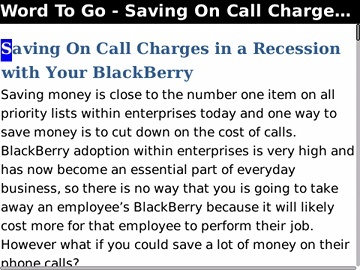 If you are new to BlackBerry and think that you want another touch screen Smartphone, you may be frustrated. All other capacitive touch screens like the Palm Pre, Motorola Droid, and iPhone 3GS, are touch all the way. You type on the virtual keyboard by touch, you navigate by touch. On the Storm 2, you must click a key to type it, or click a menu item to select it. This can frustrate you since it seems counter intuitive. Why must you click the screen when you can just touch it? Navigating can be confusing too. Instead of there being an on-screen menu button, you must click the physical menu button. Again, counter-intuitive. Without question, this is the best touch screen BlackBerry. RIM has fixed so many issues. It has added Wi-Fi, made SurePress more effective, removed the lag, and tweaked the styling. You can now use the Storm 2 to effectively to write emails - long or short. The battery will keep you going for at least a full business day. You can travel to any country thanks to the on-board CDMA and GSM/UMTS radios. You can have simultaneous voice and data thanks to built-in Wi-Fi. You can take impressive pictures with the 3.2 Megapixel autofocus camera. You can watch videos on the impressive landscape screen, and listen to your favorite music while in transit. 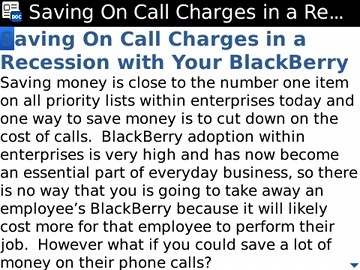 Your data can be safe thanks to BlackBerry's impressive IT Policies that can control and secure corporate BlackBerrys. The BlackBerry OS really does need an overhaul to modernize it, and the requirement to click the screen seems unnecessary, but as Smartphones go, if you are a professional who needs the best business Smartphone with a touch screen, the BlackBerry Storm 2 is the device for you. And if you're looking for the latest and greatest BlackBerry Smartphone without a touchscreen for enterprise use, be sure to check out the BlackBerry Bold 9700. I reviewed it from a Business-user perspective here.